"My name is Thomas Veil, or at least it was. I'm a photographer. I had it all. A wife, Alyson. Friends. A career. And in one moment it was all taken away, all because of a single photograph. I have it. They want it. And they will do anything to get the negative. I'm keeping this diary as proof that these events are real. I know they are. They have to be." This defunct UPN conspiracy series aired in 1995, running one season before getting the axe, but not before a small legion of fans loudly bemoaned its demise. 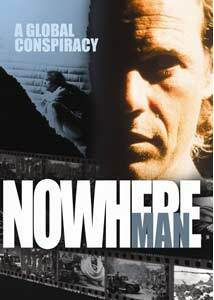 There was and has been a lot of chatter about this show in newsgroups and forums over the years, and as a paranoid conspiracy fan myself I always felt I had missed something by not being part of the Nowhere Man vibe when the show aired. Comparisons to The Prisoner and The X-Files were quite attractive to me, and when Image announced a 9-disc set of the entire series I figured my time had finally come to get my shadowy fill of coverups and global evil. Plus, there's the hand of Tobe Hooper, who directs the first two episodes as an added bit of cool. The plot is rather smoky, a compounding series of reveals that over the course of 25 episodes were supposed to have some profound dramatic impact that would have led into a second season, but with cancellation the attempt at a payoff seemed forced. The setup of the show is intriguing, with celebrated photojournalist Thomas Veil (a shaggy-haired Bruce Greenwood, looking like MacGyver's brother) finding out what it means to have one's entire life history wiped out. One moment he's enjoying a celebratory dinner with his wife (Megan Gallagher), and when he returns from a washroom visit he finds her gone, friend don't know him, his banks cards are invalid, and when he takes a cab home he finds out that even his dog doesn't know him. And to make matters worse, Veil's wife suddenly has a new husband. That's a nice hook, and Veil quickly connects some dots and makes a link between what's happening to him and the disappearance of a photo he took entitled Hidden Agenda, depicting the hanging of four hooded men in a dense jungle. Answers get doled out in small doses, as Veil spending time in an insane asylum and wandering the country attempting to find out the who's and the why's, eventually discovering the far-reaching tentacles of something called the Organization. Strange, dreamlike things happen on a regular basis, cigars and the sound of glass breaking are recurrent themes, and the implications of the show's big conspiracy really require viewers to swallow a lot in order to get to the grand denouement, one that doesn't deliver the crotch kick I had hoped for. Midseason payoffs like the secret behind the Hidden Agenda photo are excellent, but it's almost as if the show can never fully explain itself properly. I can champion a good conspiracy storyline, but it was a chore to make it through the 19 hours of Nowhere Man because I had an inherent problem with the little details that seemed to get brushed aside. Each episode may have offered some clues, but it was wrapped in some laughable acting by supporting players and even more so by lazy, convenient plot developments that further muddied my ability to willingly go along for the ride. I'll grant you this was an ambitious project�coming from producer/creator Lawrence Hertzog�and I guess me whizzing on the logic gaffes in a 10-year-old UPN series is a moot point because it has a fanbase that should embrace this set without hesitation. I'm just not one of them. Image Transfer Review: The 1.33:1 transfers are something of a disappointment, though not wholly awful. Image detail is fairly soft, with colors looking fairly flat throughout and some recurring shimmer. No real evidence of dirt or debris, but a general subdued haze exists. Quality is consistent across all 25 episodes, so I guess that counts for something here. Audio Transfer Review: Audio is offered in an English language 2.0 stereo track that provides clear dialogue, but not much else to make it stand out. Voice quality and music beds sound satisfactory without being remarkable in any way. Extras Review: Let no one accuse Image of skimping on the extras here, because in addition to nine traditional episode commentaries, there are 21 assorted video commentaries, interviews and production clips spread across this hefty set. Audio commentaries are one per disc, with participants including Lawrence Hertzog, Bruce Greenwood, Peter Dunne, Art Monteratelli, Steve Robman, Michael Levine, and Ian Toynton on episodes Absolute Zero, Paradise on Your Doorstep, The Alpha Spike, The Enemy Within, Contact, Hidden Agenda, Through a Lens Darkly, Zero Minus Ten and the finale, Gemini Man. Hertzog appears on most of the tracks, and I was a bit surprised he didn't show up on the Hidden Agenda commentary, as that is one of the most pivotal episodes of the series. Also showing up on Disc 9 is a segment with Hertzog and former UPN exec Mike Sullivan talking about the show's origin and demise, as well as Fact or Fiction? (15m:41s) where a former CIA operative (appearing in silhouette) talks about real-life conspiracies similar to what appeared in the show. Also included are a set of promos (05m:44s) and some promo outtakes (03m:57s). If you're a fan, this must be good stuff. I know this show has something of a cult following, and for fans this set is probably a digital blessing. As intriguing as the premise is, however, I found the whole experience to be a drag. The show's cancellation leaves the climax a bit unsatisfying, and the journey there over 25 episodes is a little overblown. I do love a good conspiracy, but I just can't accept what's being dished out here. On the plus side, Image has crammed this nine-disc set with interviews and commentaries, so the fan faithful will no doubt gobble this up and be very happy. I just can't recommend it.